Raymond Loewy (November 5, 1893 – July 14, 1986) was a French-born American industrial designer who achieved fame for the magnitude of his design efforts across a variety of industries. He was recognized for this by Time magazine and featured on its cover on October 31, 1949. He spent most of his professional career in the United States. Among his designs were the Shell, Exxon, TWA and the former BP logos, the Greyhound Scenicruiser bus, Coca-Cola vending machines, the Lucky Strike package, Coldspot refrigerators, the Studebaker Avanti and Champion, and the Air Force One livery. He was involved with numerous railroad designs, including the Pennsylvania Railroad GG1 and S-1 locomotives, the color scheme and Eagle motif for the first streamliners of the Missouri Pacific Railroad and a number of lesser known color scheme and car interior designs for other railroads. His career spanned seven decades. The press referred to Raymond Loewy as The Man Who Shaped America, The Father of Streamlining and The Father of Industrial Design. Born in Paris in 1893, Loewy was the son of Maximilian Loewy, a Jewish journalist of Austrian origin, and a French mother, Mme. Marie Labalme. Loewy achieved an early accomplishment with the design of a successful model aircraft, which then won the Gordon Bennett Cup in 1908. By the following year, he had commercial sales of the plane, named the Ayrel. Loewy served in the French army during World War I (1914-1918), attaining the rank of captain. He was wounded in combat and received the Croix de guerre. In Loewy's early years in the United States, he lived in New York and found work as a window designer for department stores, including Macy's, Wanamaker's and Saks in addition to working as a fashion illustrator for Vogue and Harper's Bazaar. In 1929 he received his first industrial-design commission to contemporize the appearance of a duplicating machine by Gestetner. Further commissions followed, including work for Westinghouse, the Hupp Motor Company (the Hupmobile styling), and styling the Coldspot refrigerator for Sears-Roebuck. It was this product that established his reputation as an industrial designer. He opened a London office in the mid-1930s that continues to operate. In 1937, Loewy established a relationship with the Pennsylvania Railroad, and his most notable designs for the firm were their passenger locomotives. He designed a streamlined shroud for K4s Pacific #3768 to haul his newly redesigned 1938 Broadway Limited. He followed by styling the experimental S1 locomotive, as well as the T1 class. Later, at the PRR's request, he restyled Baldwin's diesels with a distinctive "sharknose" reminiscent of the T1. While he did not design the famous GG1 electric locomotive, he improved its appearance by recommending welded construction rather than riveted and added a pinstriped paint scheme to highlight its smooth contours. In addition to locomotive design, Loewy's studios performed many kinds of design work for the Pennsylvania Railroad including stations, passenger-car interiors, and advertising materials. By 1949, Loewy employed 143 designers, architects and draftsmen. His business partners were A. Baker Barnhart, William Snaith and John Breen. Raymond Loewy's 1930s era Studebaker logo. Loewy had a long and fruitful relationship with American car maker Studebaker. Studebaker first retained Loewy and Associates and Helen Dryden as design consultants in 1936 and in 1939 Loewy began work with the principal designer Virgil M Exner. Their designs first began appearing with the late-1930s Studebakers. Loewy also designed a new logo which replaced the "turning wheel" which had been the trademark since 1912. During World War II, American government restrictions on in-house design departments at Ford, General Motors, and Chrysler prevented official work on civilian automobiles. Because Loewy's firm was independent of the fourth-largest automobile producer in America, no such restrictions applied. This permitted Studebaker to launch the first all-new postwar automobile in 1947, two years ahead of the "Big Three." His team developed an advanced design featuring flush-front fenders and clean rearward lines. The Loewy staff, headed by Exner, also created the Starlight body which featured a rear-window system wrapping 180° around the rear seat. The Starlight has consistently ranked as one of the best-designed cars of the 1950s in lists compiled since by Collectible Automobile, Car and Driver, and Motor Trend. The '53 Starliner, recognized today as "one of the most beautiful cars ever made", was radical in appearance, as radical in its way as the 1934 Airflow. However, it was beset by production problems. To brand the new line, Loewy also contemporized Studebaker's logo again by applying the "Lazy S" element. His final commission of the 1950s for Studebaker was the transformation of the Starlight and Starliner coupes into the Hawk series for the 1956 model year. The photo to the right actually shows a Starliner hardtop which does not have the "C" pillar. A concept sketch of the 1963 Avanti by Loewy. In the spring of 1961, Studebaker's new president, Sherwood Egbert, recalled Loewy to design the Avanti. Egbert hired him to help energize Studebaker's soon-to-be-released line of 1963 passenger cars to attract younger buyers. Despite the short 40-day schedule allowed to produce a finished design and scale model, Loewy agreed to take the job. He recruited a team consisting of experienced designers, including former Loewy employees John Ebstein; Bob Andrews; and Tom Kellogg, a young student from the Art Center College of Design in Pasadena. The team was sequestered in a house leased for the purpose in Palm Springs, California. (Loewy also had a home in Palm Springs which he designed himself.) Each team member had a role. Andrews and Kellogg handled sketching, Ebstein oversaw the project, and Loewy was the creative director and offered advice. 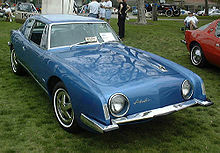 The 1963 Studebaker Avanti in a non-standard blue color and wheels. Loewy retired at the age of 87 in 1980 and returned to his native France. Loewy died in his Monte Carlo residence in 1986. He was raised in Catholic faith and upon his passing, was buried in the cemetery of a Roman Catholic church of Rochefort-en-Yvelines in France. He was survived by his wife Viola, and their daughter Laurence. In 1992 Viola and Laurence Loewy, with the support of British American Tobacco, established the Raymond Loewy Foundation in Hamburg, Germany. The foundation was established to promote the discipline of industrial design internationally and preserve the memory of Raymond Loewy. An annual award of €50,000 is granted to outstanding designers in recognition of their lifetime achievements. Notable grantees include Karl Lagerfeld, Philippe Starck and Dieter Rams. In 1998, Laurence Loewy established Loewy Design in Atlanta, Georgia to manage her father's continued interests in the United States. Laurence died of natural causes October 15, 2008 and is survived by her husband David Hagerman and son Jacque Loewy. David Hagerman, CEO of Loewy Design and Representative for the Estate of Raymond Loewy, manages daily activities and is directly involved in museum planning. The Loewy family's collection of archives are currently being restored, cataloged and photographed for future events and fundraisers. Fundraising efforts have begun to build the Raymond Loewy Museum of Industrial Design, a 501c3 non profit, originally envisioned by Laurence Loewy. On November 5, 2013, Loewy was honored with a Google Doodle depicting a streamlined locomotive bearing a resemblance to the K4s Pacific #3768 shroud design, using the wheels of the train to form the word Google. Setright, L.J.K., "Loewy: When styling became industrial design", in Northey, Tom, ed. World of Automobiles (London: Orbis, 1974), Volume 11, p.1211. Automotive Design Oral History – "Reminiscences of Robert E. Bourke"
L’église de Rochefort et son cimetière on the official website of Rochefort-en-Yvelines. Raymond Loewy on the official website of Rochefort-en-Yvelines. "MUSEUM SITES ARE BEING STUDIED". www.loewymuseum.org. Retrieved 26 February 2013. "Google Doodle celebrates the 'father of industrial design' Raymond Loewy". IGN. November 5, 2013. Retrieved November 4, 2013. "Hughes' Stratoliner". Planeboats.com. Retrieved 2009-10-25. "Hallicrafters S-38 shortwave radio made in 1946". Arsmachina.com. Archived from the original on 2005-12-30. Retrieved 2013-11-05. Staff (2010-07-09). "National Register Information System". National Register of Historic Places. National Park Service. Douglas J. Harnesberger and Nancy Kraus (July 1998). "National Register of Historic Places Inventory/Nomination: Norfolk and Western Railway Company Historic District" (PDF). Virginia Department of Historic Resources. "DESIGNED TO TRAVEL; Curating Relics of T.W.A. As It Prepares for Departure". New York Times. June 7, 2001. Staff. "Union News restaurants, TWA, Idlewild. Lisbon Lounge". www.loc.gov. U.S. Library of Congress. Retrieved 1 November 2014. "SPAR". Raymond Loewy Foundation. Retrieved 2009-10-25. "Celebrate America this July with Gary Kollberg's Exhibit at the Farmington Library". Farmington Library of Art, Farmington CT, July 2009. "What's in a name? Scope Arena, Norfolk". The Virginian Pilot, Pilotonline.com, Patrick Wilson, March 23, 2009. Norfolk and Western Railway Roanoke, Virginia station renovation (now the O. Winston Link Museum), 1949; the building is included in the Norfolk and Western Railway Company Historic District, listed on the National Register of Historic Places in 1999. Union News restaurants coffee shop, at the TWA Flight Center, Idlewild. Greyhound Lines Coach PD-4501 Scenicruiser (US Patent 2,563,917), 1951. The International Harvester "IH" "Man on a tractor" logo, 1952. Northern Pacific Railway, Vista-Dome North Coast Limited (exterior color scheme and interiors), 1954. Coca-Cola Redesign of the original contour bottle, eliminating Coca-Cola embossing and adding vivid white Coke/Coca-Cola lettering, designed and introduced first king-size or slenderized bottles, that is, 10, 12, 16 and 26 oz. (1955) Later, in 1960, he designed the first Coke steel can with diamond design. Rosenthal Sunburst modern china set 1956. Hillman Minx automobile, Series One onward, 1956–1959. Sunbeam Alpine automobile, series One onward, 1959-1967. The USCG Racing Stripe logo (1964). New York City Transit Authority R40 car, whose slanted-front end design had to be retrofitted with guide and guard rails, along with pantograph gates due to safety concerns, 1967. Elna's Lotus compact sewing machine; in the Design Collection of New York's Museum of Modern Art (MOMA), 1968. Panama Pacific Line: Loewy designed the interiors for a trio of American-built cargo liners named the SS Ancon, SS Cristobal and SS Panama. Dorsett "Catalina", a popular early fiberglass pleasure boat.